With its compact size (20 sq. km. 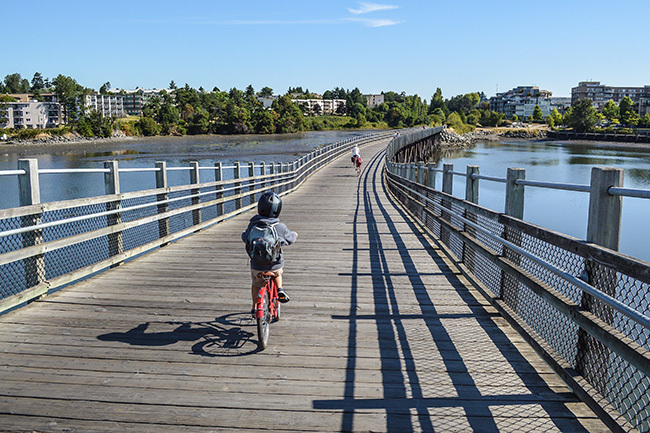 ), mild (and relatively dry) climate, and flat terrain, one could easily make the argument that Victoria offers some of the best conditions for cycling in all of Canada. And during the 1980s and 1990s, local leaders made some modest steps to take advantage of those favourable conditions – including a series of rail-to-trail conversions, and a basic set of painted bike lanes and sharrows – resulting in nearly 10% of their population biking to work, the single highest rate in the country. But as many other North American cities began investing in networks of protected bike lanes, and subsequently watched their ridership levels rise, Victoria seemingly sat on its hands, content with its self-appointed crown as “Canada’s cycling capital” (a title local advocates and politicians are now trying to distance themselves from). Disappointingly, the city failed to update its Bicycle Master Plan for two decades, and as a result, cycling uptake has stagnated for the past 15 years. Slowly, Victoria fell behind the rest of the continent, and is now realizing it has some catching-up to do, in order to bring an inadequate, out-of-date, and disconnected bicycle network up to 21st Century design standards. Underlying all of this is a seismic shift in the demographic make-up of the city, which is having a tremendous impact on its political and economic landscape. No longer Canada’s retirement home, Victoria is seeing an influx of youth and innovation, as technology and film companies flee the affordability crisis across the Salish Sea in Vancouver. And this generation of entrepreneurs brings with them a desire for proximity, mobility, affordability, simplicity, pragmatism, and sustainability. This generational demographic shift became most apparent after the election of a young idealist who ran on a promise to bring a ‘minimum grid’ of AAA (all ages and abilities) bike infrastructure to Victoria. 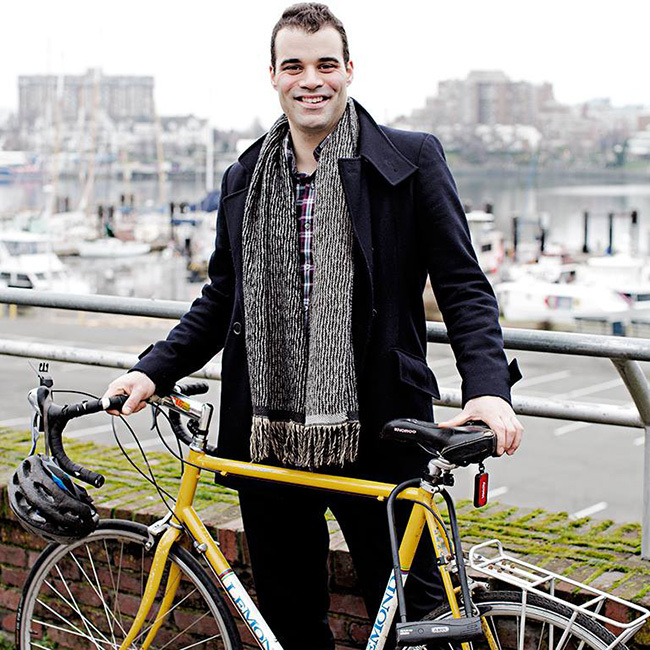 In his mid-30’s, Councillor Jeremy Loveday comes from an arts-based background, as well as a board member of the Greater Victoria Cycling Coalition (GVCC) – not necessarily the traditional roots of your typical politician. And it was a talk given by [Bogota’s former Commissioner of Parks] Gil Peñalosa of 8-80 Cities, through the Capital Regional District and GVCC’s Transform Speaker Series, that informed much of the civic discourse heading into the November 2014 municipal election campaign. “I spoke to constituents about cycling at every door I knocked, and was surprised to find such a positive response,” remembers Loveday. But it was following his election, when council started voting unanimously on cycling initiatives that he was to have his biggest surprise. This was a sure sign that the city was ready to dedicate time and funding to increasing the mode share on their streets, and that the best way to do that was to follow through on Loveday’s promise to build a ‘minimum grid’. For Loveday, he sees the construction of safer infrastructure as the key to enabling mobility for all ages. “I want kids and retirees in Victoria to have an equal opportunity to cycle safely,” he noted. With an aging father who has ridden a bike all his life, Loveday looks forward to providing him (and his counterparts) with better infrastructure beyond the Lochside and Galloping Goose Trails. Building a network nearly all at once will make that proposition a viable – and exciting – reality. 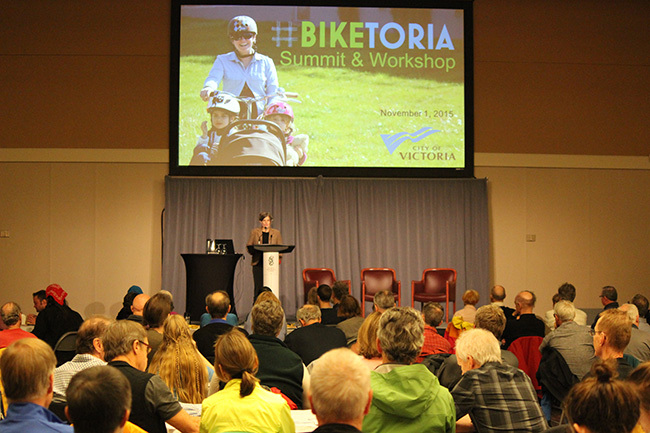 When the City of Victoria issued a request for proposals (RFP) for its #Biketoria plan in the summer of 2015, Kate Berniaz of Urban Systems saw this as a once-in-a-lifetime opportunity to draw from years of research, travel, and dreaming, and shape her hometown for the better: “We quickly assembled an international ‘dream team’, including [the aforementioned] Gil Peñalosa of 8-80 Cities, [Portland’s former Bicycle Program Manager] Mia Birk of Alta Planning, and [Copenhagen’s former Bicycle Program Manager] Andreas Røhl of Gehl Architects,” she boasts. 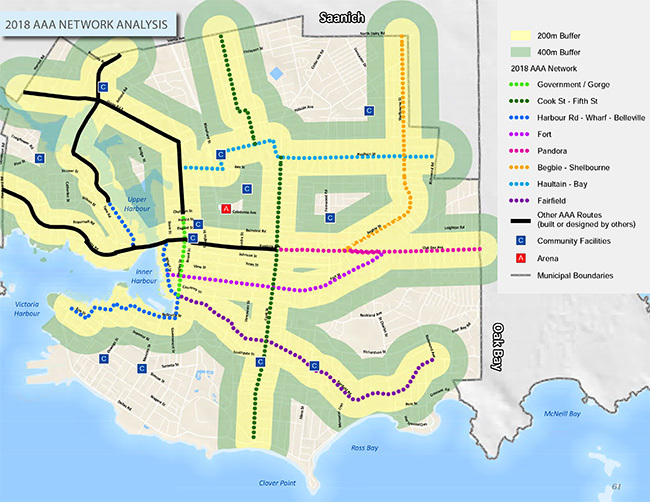 The direction from mayor and council was incredibly ambitious: to consult, design, and construct a “minimum grid” of eight protected bike lanes – between 20 and 25 km. that would put nearly all of Victoria’s 82,000 residents within 400 m. of a route – before the end of their four-year political term in 2018. Building on preliminary work completed towards the tail end of the previous administration in 2014, the Urban Systems-led consulting team held a series of public engagement labs this past November, speaking to over 400 residents, stakeholders, and community leaders at (indoor and outdoor) locations across the city, including a pop-up protected bike lane on Cook Street conceived and executed by the Greater Victoria Placemaking Network. “The single biggest thing we heard throughout the consultation process was ‘I’d bike more if it were safer,’” Berniaz says. To that end, Urban Systems presented eight corridor design concepts for public input during a series of public salons in December, and are currently refining their final recommendations, including a total budget, which will go before council this coming spring. Beyond the celebrity planners and bold strategy, perhaps one of the most intriguing and unique aspects of the design and planning process has been the development of a brand-new course in the Geography Department at the University of Victoria. This course came together out of a chance meeting between faculty members Dr. Cameron Owens and Dr. Trisalyn Nelson. Students had returned from Dr. Owens’ field school studying planning innovations in Northern Europe, inspired to make a difference in their own communities. 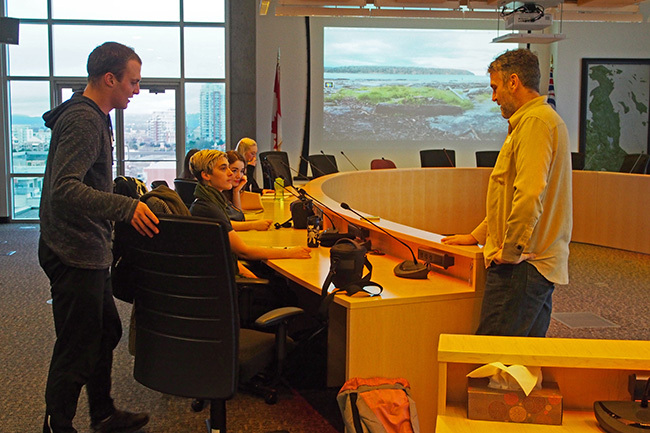 During a meeting with mayor and council to explore opportunities for collaboration – to which Owens had invited Nelson, an expert in spatial data – Mayor Helps wondered aloud about a community-embedded education opportunity modeled after Vancouver’s now-famous CityStudio program. 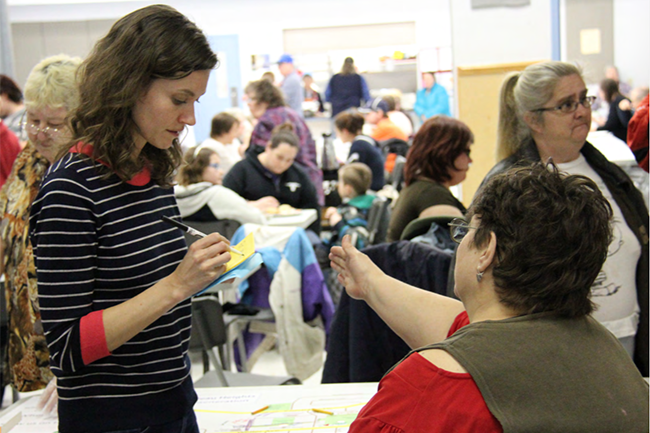 “In less than a week, we drew up a pilot course that would combine the Geography Department’s desired learning outcomes with a meaningful work experience, while meeting the city’s needs of supporting real research and outreach,” says Nelson. The interest among students proved as passionate as council’s, and within a week, the 30 student enrollment was met, and on January 7, the class was off and running. #Biketoria provides a rare opportunity for collaboration between today’s professionals and those of the next generation, where students act as an extension of the city’s transportation department and Urban Systems’ team, while critically scrutinizing the process. Working from the Capital Regional District office in the city centre rather than UVic’s remote campus, students will be able to better visualize the spaces slotted for development, and interact directly with the community. “Course work will include assisting with data collection, studying the various design and implementation options, and working with the engagement process – all while gaining firsthand, real-world experience that will provide a tremendous edge after graduation,” Nelson says hopefully. 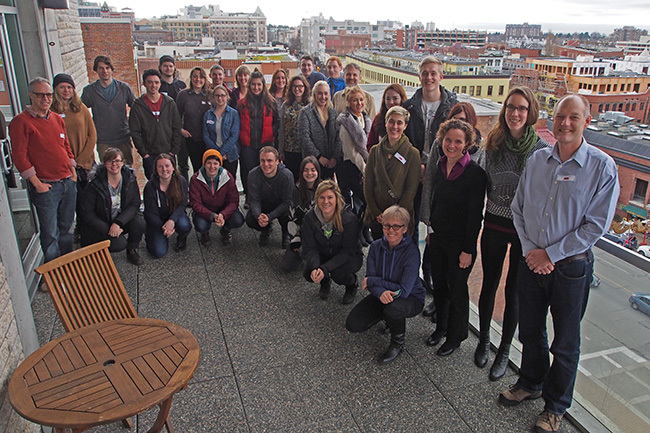 Although still in its inaugural phase, Nelson and others involved hope the overwhelming popularity will lead to a full-time “CivicStudio” program in Victoria; environed as a collaborative learning hub where students from various learning institutions work with governments and community organizations in support of the region’s livability and sustainability goals. While it’s still too early to declare #Biketoria a success, it is clear that the pieces are in place for something special. It could easily act as a model for small cities around the world looking to compete with their mid- and large-sized counterparts, and implement ‘minimum grids’ of bike infrastructure in an accelerated manner. It is also incredibly refreshing to see politicians willing to take a leap of faith, and focus their efforts on results rather than reelection. For that, leaders such as Mayor Helps and Councillor Loveday deserve full credit. If the Calgary experience is any proof, building a AAA bike network overnight has immediate, long-term impacts on mode share, road safety, and the types of people riding bikes. We sincerely hope mayor and council follow through on their bold vision, with sufficient budget and staff resources to implement the full #Biketoria plan. Admittedly, #Biketoria has seen some bikelash in recent weeks, as opponents to the plan speculate wildly about induced congestion, reduced parking, and loss of business. But our experience in hundreds of other cities around the world tells us it is exactly that: baseless speculation. Rather than shy away from the criticism, Victoria leaders must embrace this controversy. Without it, you aren’t building anything worthwhile.